Created in 2007, millions of children access the online Moshi Monsters space every day to play games and swap their favourite characters. Vivid Imaginations holds the UK licence to distribute Moshi Monsters toys and playsets - and one of the showcase playsets in their range is the superb Moshling Treehouse which you can see below. The treehouse provides the perfect place to play with your favourite Moshis. A fully working basket lift will keep all your little monsters entertained - and the playset cleverly opens up to reveal a space where you can store your figures when they need a rest. Ideal for children aged 4 and over, this Moshling Treehouse has proven a runaway success. If demand for these little monsters continues at the current rate, we wouldn't be surprised if this is the first playset of many. 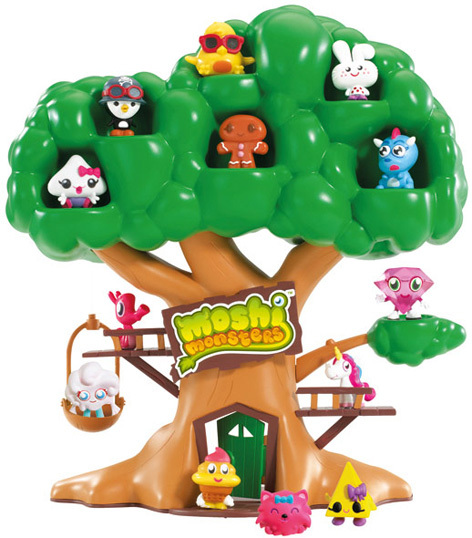 Please tell us what you think of the Moshi Monsters Moshling Treehouse by Moshi Monsters. 2.) It isn't big enough. 3.) When a Moshling goes up and down in the lift, other Moshlings fall of the tree. The Roxy figure is so cool - that's why I got it. The treehouse could have been bigger but 5 stars because of Roxy. This is not big enough and doesn't come with enough figures.